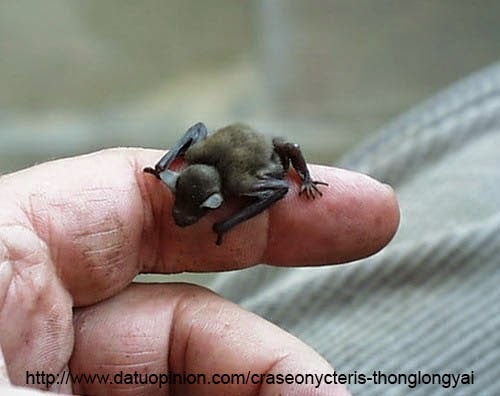 Craseonycteris thonglongyai in the vernacular is called Kittis hog nosed bat or the bumblebee bat. Kittis hog nosed bat only grows to 33 mm in length at the most and weighs about 2 grams when it is fully grown. This makes it the smallest mammal by length, but not by weight. They tend to live in flocks of around 100 individuals. Like most small bats they are insectivores. Kittis hog nosed bat can only be found in Sai Yok province, Thailand. 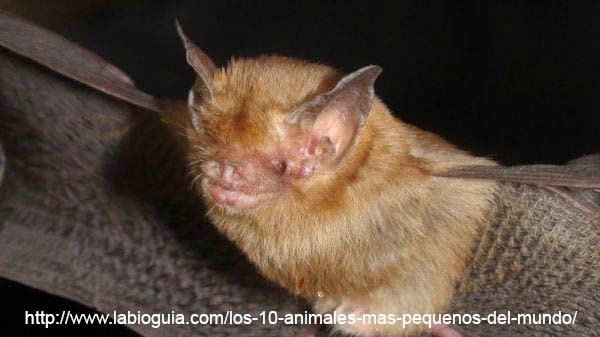 Kittis hog nosed bat is quite distantly related to any other living bat and is the only extant described species in the family Craseonycteridae. Yeah, that would be a big bat its fixed now.